The Basic Medieval Tunic will keep you cool during the summer months. This lightweight tunic fits well and provides a perfect medieval period look. The cotton texture makes this garment extremely versatile at creating an authentic look. Decorated with a contrasting border at the neck, hem and cuffs. Comes with full length arms and slightly flared bottom. 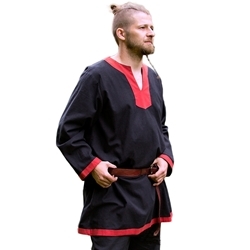 This is a finely crafted tunic suited for any Medieval or Norse enthusiast and will can be worn by men or women. Care Instructions: Machine washable in warm water with similar colors (Wash separately first time). Do not bleach. Tumble dry on low heat, may shrink up to 5%. Can be ironed with medium heat.